I noticed on the top of Acumatica screens, under the Help menu, there is an option called Get Link. I tried it out and got very excited about the potential. Basically, you can open a record on a screen and then get a hyperlink that will open the screen for you and take you to the exact record that you were looking at. This got me to thinking about the lowly hyperlink. There are lots of great advantages to using web-based software like Acumatica. When we think of web-based software, things like “always on”, “accessibility”, “bring your own device”, “cloud”, “redundancy”, “scalability”, “SaaS”, etc. come to mind. Not many people think of the lowly hyperlink, but it’s a huge part of why we like web-based software so much. Think about it, when you click on a hyperlink, it takes you to where you want to go, it happens fast, and it’s very reliable. It works on any computer, on any smart phone, on any tablet, and in any application regardless of if you are in Microsoft Office, Apple iTunes, Adobe Acrobat, etc. There is nothing to install or configure, it just plain works. I can put a hyperlink in a Microsoft Word document, a PowerPoint presentation, or a slick looking Marketing PDF file and have the confidence that it is going to work. The only thing that prevents a hyperlink from working is if the person trying to use it doesn’t have an internet connection, but that is increasingly rare these days. Also, hyperlinks can be very intelligent, containing lots of information. When you click on an advertisement on a webpage, for example, you are taken to the advertisers website. However, the hyperlink that sent you there had the webpage that you came from embedded in it. This allows the advertiser to know which advertising affiliates are giving them the most leads. There is even the new QR Code which many people are using like a physical hyperlink. They put it on printed brochures so a person can scan the code to be taken directly to a relevant web page for more information. Real estate agents can put one on an info sheet about a house so a buyer can scan and easily be taken to a webpage with more information about the house. A grocery store can put one on their weekly mailer with a caption that says “scan this for exclusive web coupons” in order to drive more traffic to their website. A business person can put one on their business card which will take a person directly to their LinkedIn profile. It’s basically a hyperlink that exists on a physical piece of paper or sign, etc. 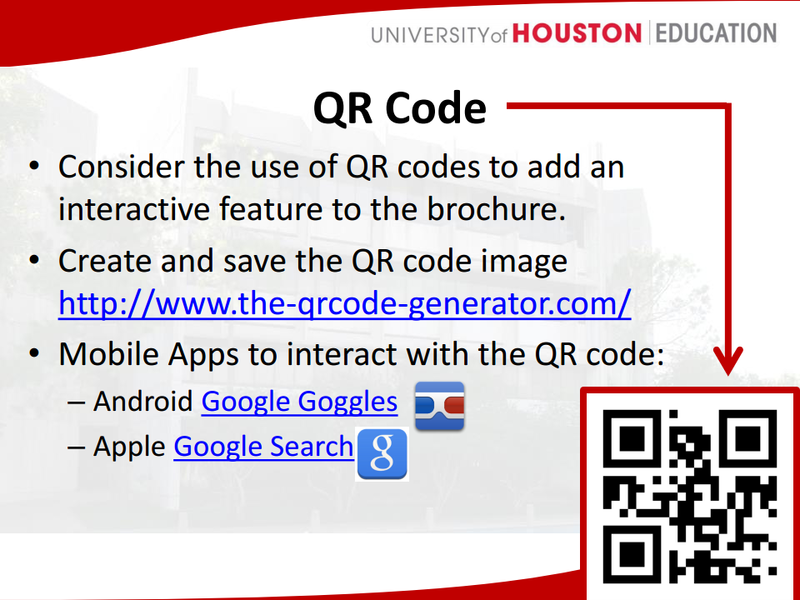 Here is an example of a brochure about QR Codes that uses a QR Code. Another way web-based applications use hyperlinks is by tying them to images. Many applications use images that look like buttons and then tie them to a hyperlink. For example, take these image hyperlinks from Google as examples. They look like buttons, but they are really just lowly hyperlinks. So, basically the hyperlink is a very under appreciated, but very important part of web-based applications. It’s kind of like the tires on your car. You might like to focus on the powerful engine, the immaculate paint job, or the shiny rims, but you aren’t going anywhere without the tires. 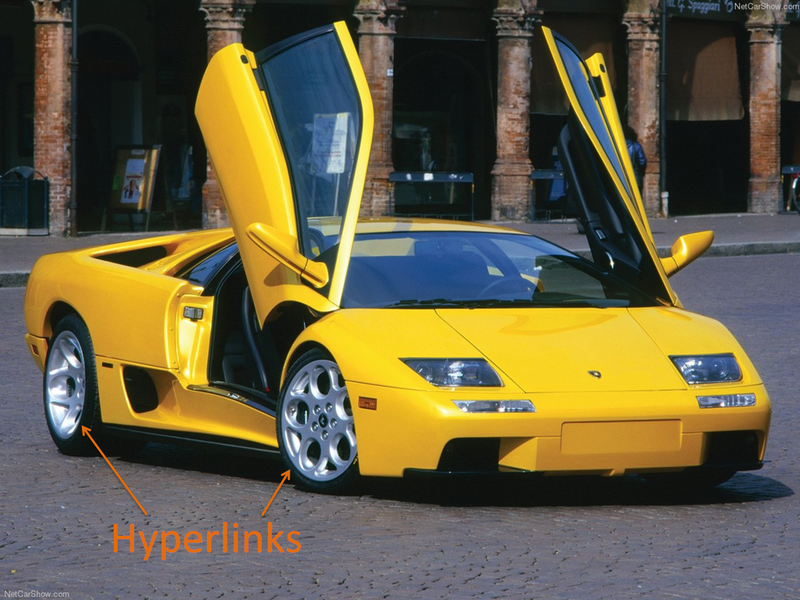 Hyperlinks are like tires, they enable you to get to where you want to go. So enough about hyperlinks, let’s get back to the Help -> Get Link feature in Acumatica. 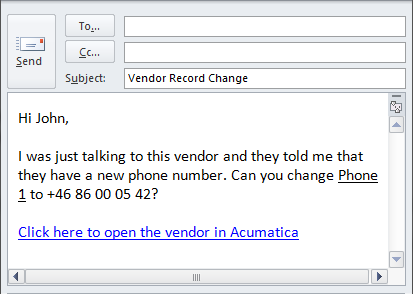 Let’s say that you work in the Purchasing department and, while you are looking up a vendor using the Vendors (AP303000) screen in Acumatica, you notice that the phone number is not correct. Now, when your company implemented Acumatica, they put the Accounts Payable department in charge of maintaining the vendor information. So, you can view the information, but you aren’t able to make any changes. Instead, you need to ask someone in the Accounts Payable department to make changes for you. 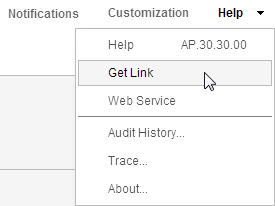 You can send the AP person a link to the specific vendor record that you are looking at. You can click on Help -> Get Link in the upper right-hand corner of the screen. This will open a window containing two hyperlinks. You notice that a salesperson’s expense report is incomplete so you send them an email with a link to their expense report in the email. Especially if the salesperson is travelling, it makes it much easier for them to open the expense report on their phone when they have a direct link to it. 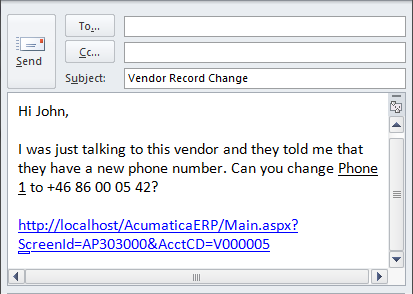 A customer who submitted a support case using the Customer Management module in Acumatica calls to get a status update. While you are on the phone with them, you update the notes on the case and send them an email with a link to the case with the updated notes. You print a small QR Code on your customer invoices. When a salesperson is out at a customer, the customer shows them the invoice and complains that they shouldn’t have been billed for the service. The salesperson scans the QR Code using their phone which takes them to the invoice screen in Acumatica where they are able to see further information about the invoice, including private notes which give them a better understanding of why the customer was billed.